Those of us who want to shoot photographs successfully and with pleasure should make sure that they have reliable good-quality equipment. The focus should not only be directed toward cameras and lenses, but should also include the little things that are sometimes overlooked as seemingly unimportant. For this reason, the B+W filter range has been expanded to include accessories that, in combination with filters, are necessary and useful. 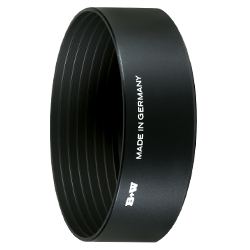 B+W adapter rings for fitting filters, auxiliary or conversion lenses, and other attachments to lenses with different filter thread sizes. 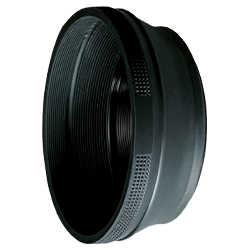 They are generally used to adapt filters or attachments with a larger diameter to lenses with a smaller diameter. For photographic equipment that includes lenses with 52 mm and 49 mm filter threads, for example, they enable 52 mm filters to be used on both groups of lenses. This not only saves money, but also saves space and weight in your camera bag. 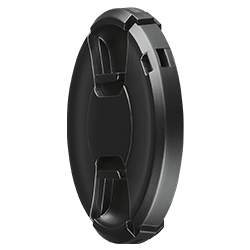 The B+W Snap-Cap Pro 311 is a lens cap with two spring-loaded plastic claws that click into the filter thread. This ensures that the cover sits firmly and securely without any time-consuming screwing and unscrewing. The claws can be operated from the side as well as from above. The cap can therefore be fitted and removed through a lens hood, as long its barrel is not too long. If photo equipment is to include lenses with different filter thread diameters, the B+W adapter rings can adapt filters and supplementary lenses to different lens diameters. This is less expensive than buying several lenses with the same filter type – money that would be better invested in a larger selection of filters. When buying filters, first check the largest diameter required. When there are three different diameters to cater for at the same time, adapter rings can also be combined if necessary. Increased thickness due to using several mounts can result in vignetting. 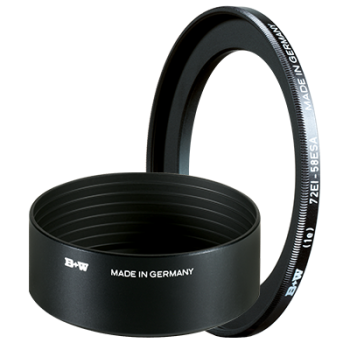 B+W offers a wide range of adapter rings. Hard plastic cap with two spring-loaded plastic claws opposite each other that engage the front thread of the lens (or filter). Simple removal by pressing the two buttons together means fast and uncomplicated one-hand operation. Available for thread sizes 52, 55, 58, 62, 72 and 77, 82 and 95. 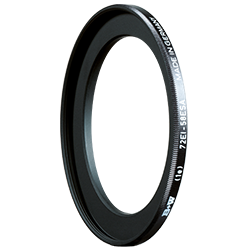 B+W metal lens hoods convey a reassuring, stable impression by their very appearance. The black anodized aluminum reliably blocks stray light, and the precision-engineered tubes have black inner ribs for even greater bsorption of unwanted light. Collapsible lens hoods are made of high-grade rubber. Their advantage compared to fixed lens hoods made of plastic or metal is that, in their collapsed state, they protrude only a short distance. This means that the lens hood can remain attached to the lens and, together with the camera, will also fit into a tight photo bag.